Rewind 10 years, if we had wanted to complain to a company for bad service or for disagreeing with something they sold we wrote a letter, email or marched down there for some good old fashioned faced to face interaction. Fast forward to 2014 and we, as consumers have the power. Annoyed your bacon batch hasn’t got enough bacon on? Why bother with the awkward face to face complaint in store, snap a photo, find them on Twitter and compose an angry 140 rant with said photo attached. Result? They reply, hugely apologetic and you might get a £10 voucher out of it – result. This is all light hearted, I just want a freebie for being fobbed off with more batch than bacon but this platform is hugely useful when things get serious. Last night, Katie of Scarphelia shared a photo of what we (and the majority of people on my timeline) thought was hugely offensive. 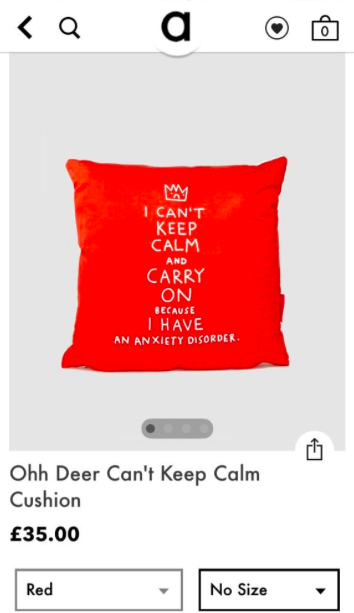 ASOS decided to stock a cushion which was taking the piss out of anxiety sufferers. I don’t suffer with anxiety myself, but I don’t think that matters, it’s something that thousands of people live with daily, and it can be incredibility difficult. Of course, ASOS saw the ‘drama’ created on Twitter and have since removed it from sale. There, the power of social media. Although I’m happy this has been removed I ask WHY has one of the UK’s largest online retailers decided to stock this in the first place? People are finally starting to open up about anxiety, where it used to be sort of a taboo subject, and ASOS are playing on that? I’d love to know who said ‘yes’ to this being stocked, then as it passed through each department to ensure this was in stock and on site NOBODY QUESTIONED IT. Frankly, I’m sick of brands having offensive products on site, removing them only when a fuss is kicked up on Twitter and then it all going back to normal. Urban Outfitters have done it multiple times and I refuse to shop there. This shouldn’t go away just because they’ve removed it from sale. Why is this OK? I’m sick of brands getting it wrote, you only have to read this post to see that it isn’t just in products they stock, brands aren’t thinking about their image on social media either. Haha thank you! It os so frustrating, i could understand this happening once, but its everywhere lately! As someone who suffers from Anxiety Disorder, that cushion is a joke and shouldn’t have been allowed on the website in the first place! I love this post! So well written and easy to read. I totally agree with the points you made and also thought it was a disgrace that the cushion was allowed to ever be sold. I’d love to know who even suggested it. But its great how powerful social media is these days.. Its good to know that everyone can have a say! probably to generate interest on social media. No publicity is bad publicity and all that. It’s ridiculous and needs to stop. Oh Beth, you are saying everything we are all thinking! How many times do these quirky brands such as UO/Joy/ASOS think they can get away with making a mockery out of a real illness. Just because it is invisible does not make it okay. I have also been tweeted by someone who is suffers from anxiety and thinks the cushion is all ok. Everyone is entitled to their opinion & I will gladly listen however, I for one, do not think it is okay to play on this sort of illness, especially when it’s things like this that actually flares the illness on! Would brands make a mockery of someone who had their leg blown off in combat? Would they take the piss out of someone who is deaf and has never heard a word or sound in their life? It just goes on & on…..
Who even wants to buy things like this? People who don’t suffer with anxiety? I don’t think so.. People who do suffer? Definitely not! I just don’t know why items like this exist and who allows them. What a great post, I didn’t see anything on twitter but I’m actually quite offended by this. I think people including myself are offended because it makes light of anxiety which then perpetuates the stigma of mental health as a whole, like it’s all a bit of a joke and not as bad as people think but it is. I’ve recently been diagnosed with anxiety disorder myself and at the moment things are a struggle so by ASOS displaying things like this it makes me think that it shows people dont take mental health seriously, think its ok to give you what they think is helpful but is misguided advice, to tell you to chill out have a bath and it’ll all be ok. It’s not like that and it’s disgraceful that brands like UO and ASOS are helping with this. Sadly I think some brands get a lot of publicity out of these slip ups. They remove it from sales and people continue to shop there, along with others who hadn’t heard of the brand or hadn’t thought to shop there in a while. It puts them in their eye line again. It’s not a big deal for them, though for the people it offends it’s a huge deal. It’s not right at all. I would love to be a fly on the wall at the meeting where it was decided they would stock that cushion. They need to take a look at who they’re hiring as buyers and start banging heads together, fact is, people don’t see these kinds of things as harmless jokes, so many charities are working hard to get people to open up about mental health and anxiety disorders and selling ridiculous crap like this just put’s all their hard work 10 steps back instead of forward! The buyers just don’t care, they have a breif, and a budget and they just say yes. I would never even DREAM of sellnig that! I saw a comment on reddit once about something like this and a guy said that every “creative” job should have some boring tweed wearing old historian type whose job it is to tell people trying to be “edgy” that it’s a moronic and offensive idea. I’m so glad i found this post. Although only mildly, I do suffer from social anxiety and I am fully aware that it has affected my ability to live my life how I would really want to on a number of occasions. Whoever said yes to stocking this product obviously has no idea what people with anxiety have to go through on a daily basis and should be made to go on an anxiety awareness course. I’m sick of some peoples naivety about the whole thing. If you don’t understand it then don’t talk about it. Woww I’d never seen this cushion until now – how could they ever think that was appropriate!? Great post, it amazes me how social media has become so powerful and will probably get even more powerful!